Apple today announced that its first retail store in South Korea opens on Saturday, January 27, at 10:00 a.m. local time, just a few weeks prior to the 2018 Winter Olympics opening ceremony in Pyeongchang on Friday, February 9. The store is located in the upscale Garosugil shopping area in the Gangnam District of Seoul, the capital of South Korea. The location will be open seven days per week and, like other Apple retail stores, it will host Today at Apple sessions and have a Genius Bar for device repairs and troubleshooting. By the looks of it, this should be Apple's 500th retail store around the world. That total includes the Apple Park Visitor Center and Infinite Loop locations, which both sell Apple products alongside promotional merchandise, and it also factors in the rare permanent closure of Apple's Simi Valley store last year. It's possible that Apple could announce at least one other new store opening between now and late January, such as its nearly ready Vienna, Austria location, in which case the Korean store would obviously not be exactly 500th. We've reached out to Apple for an official store count and we'll update if we hear back. 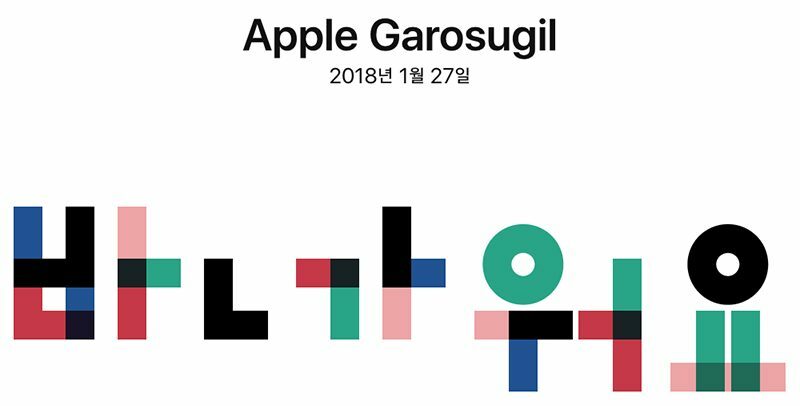 Apple is promoting its Garosugil store with a colorful, animated greeting in both English and Korean on its website, with a matching mural along the storefront that now reveals the January 27 opening date to those passing by. Apple confirmed plans to open its first store in South Korea just over a year ago, and both construction and hiring have been underway since. The store was originally reported to open December 30, but the location evidently wasn't quite ready in time, and it'll now officially open in less than two weeks. Apple's first two stores opened in May 2001 at shopping malls in Tysons Corner, Virginia and Glendale, California. By our count, Apple now has 272 retail stores in the United States, while this Garosugil location will be its 228th retail store elsewhere, pushing it to the 500 mark in less than 17 years. Apple remains in the process of renovating dozens of those stores with a fresher aesthetic. Many of the locations have expanded by adding a floor or taking over adjacent storefronts, while some stores have relocated entirely. You could partially blame Samsung and other Korean manufactures for that. They've been in cahoots with the government over keeping Apple at bay for as long as possible. Good timing with the Winter Olympics coming up. No. You can't. Frisbee stores (which look exactly like Apple stores even down to the tables and uniforms) have been operating in all the major shopping malls and districts in Seoul for years. Apple had very little penetration into the Korean market because LG and Samsung offer better deals and packages specific to Koreans. For example, LG is a mobile carrier in Korea with the LGU+ network, and Apple's phones do not work on that network at all. Samsung built Bixby specifically for Koreans in their own language. S-Pay was built to work with existing payment terminals in Korea (most of which don't use NFC, but still Magnetic Strip) and their phones have tighter integration with apps from Naver and Daum/Kakao - which is essential for things like Maps. Apple have had a presence in Korea since the iPhone 3G was released with Frisbee. They just weren't that popular and a lot of Korean apps didn't bother to make iPhone versions. Only now does Apple have enough market penetration in Korea to open one store in an an affluent area of Seoul. It's been confirmed that the gov't deterred Apple's penetration? There were laws specifically discouraging import of foreign cellphones into the country. One was mandating the installation WIPI platform onto the phone, and the second was requiring schematics and hefty testing costs to import cellphones even personally. The first one was originally made in good faith, to foster interoperability of phone apps across different carriers, but it also inhibited import of foreign phones, effectively acting as a trade barrier. It was withdrawn in early 2009, mere months before the introduction of iPhones in Korea. The latter was also relaxed around the similar timeframe. Whether the whole thing was willful play is up for debate, but that the government deterred Apple's entry into Korean cellphone market is without doubt. I wonder whether they’ll sell special edition Olympic watch bands (sport loop this time round?) at the store like they did with the country-themed woven nylon band during the summer Olympics in Rio. Can't beileve 499 stores had to be opened before opening one in the country of their most important competitor. Not understanding why that's hard to believe. What is that Hangul logo saying? Edit: To elaborate a bit, the way it's written, "바ㄴ가워요", is technically a bit broken as it should be "반" instead of "바ㄴ" for the first letter, but I think it's just a bit of typographical liberty at play. I would have expected "반갑습니다" (ban-gapseumnida), which is a more formal way of saying it. The one used by Apple is has a more informal, friendly tone. I'm not sure why Apple is trying to be so friendly all of a sudden after sort-of neglecting the customers for so long, but oh well. Uh-oh. That's 1 store for every 15 million people worldwide. So Apple will have to reach 1500 stores before they get around to us here in New Zealand. Seems to be same in Finland.